While another school year comes to a close for 1st, 2nd and 5th years, there is still the matter of Junior and Leaving Certificate exams to be undertaken by others. Starting on Wednesday, June 8th the exams run until the 24th. We wish all those students sitting these tests the very best of good luck. There will be mass celebrated in the college church at 8.30am each morning of the first week of the exams, Wednesday to Friday inclusive, for any students and/or their parents who wish to attend. On Friday, May 27th, the college church was the scene of a very special occasion as Bro. Colm O’Mahony was ordained a deacon by Bishop Denis Brennan. Bro. 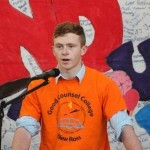 Colm, a native of Cork, has been a wonderful addition to the staff of Good Counsel over the past year and we wish him the very best for his future ministry. One of the most popular events on the school calendar is the annual Parents’ Council barbeque for 6th year students and once again this year the parents pulled out all the stops to provide a wonderful array of food for the Leaving Cert. cohort. The aroma which wafted across the school campus had many junior students salivating for the fare on offer and a few brazen but vain attempts were made to infiltrate the proceedings. Many thanks to the parents for the huge amount of work put into this event and I know the boys were equally appreciative of their generosity. The awards for footballer and hurler of the year were presented on the occasion of the barbeque to Colm Foran and Jack Guiney respectively while the Ryan Family cup for most improved rugby player went to Hugh Keenan.Congratulations to all. Recent past pupil, Jack Harte, made the headlines this week winning the People’s Choice award at the Blooms Garden Festival in the Phoenix Park last weekend. This was in addition to winning thesilver medal in the small gardens category for his creation,’ An Adventure with Thumbelina’ . You can see an interview with Jack in his garden creation by clicking on the link below. 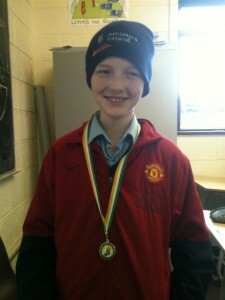 Well done Jack! 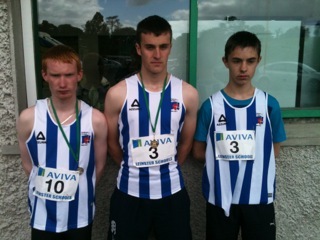 Our school was represented in the Leinster track and field athletics finals in Santry recently and wonderful performances saw Eoin Power take gold in the Senior boys 110m hurdles, Paul Manning winning the Minor boys 500m and Jordan Byrne throwing a personal best in the Javelin. Since then Eoin Power has gone on to claim the All Ireland title with a brilliant performance in the Tullamore Harriers club on Sunday last. It is difficult to overstate the significance of his achievement in an event which requires suchspeed and technical precision especially as he is still quite young and all in Good Counsel are extremely proud of his success. In addition 1st year student Joe Mooney who won the South Leinster Junior boys walk finished 4th in the Leinster final of the event and given that he is under age for this event again this was another fine achievement. Another group of 1st year students recently went down to play Bridgetown V.S in a Basketball Friendly and they put up a tremendous performance scoring freely and looking like a team who had spent a lot of time together in preparation. the opposition had no answer to the power and skill of players such as Vyto, Leonardo and Kamil with equally impressive performances from Paul, Liam and Calem. In truth it was a real team success and well done to them and to Mr Bates for organising and taking care of the event. 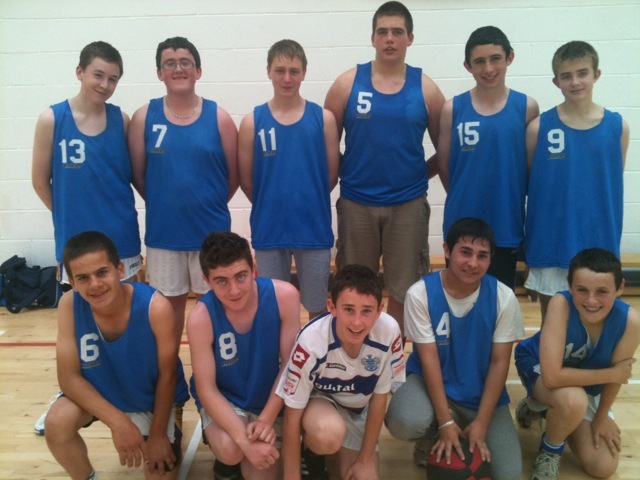 1st Year Basketball Team who played Bridgetown V.S. Finally, may we wish all staff, students and parents a very pleasant and safe summer, hoping that all will return refreshed for the new school year in August.